Over 1500 Sq. 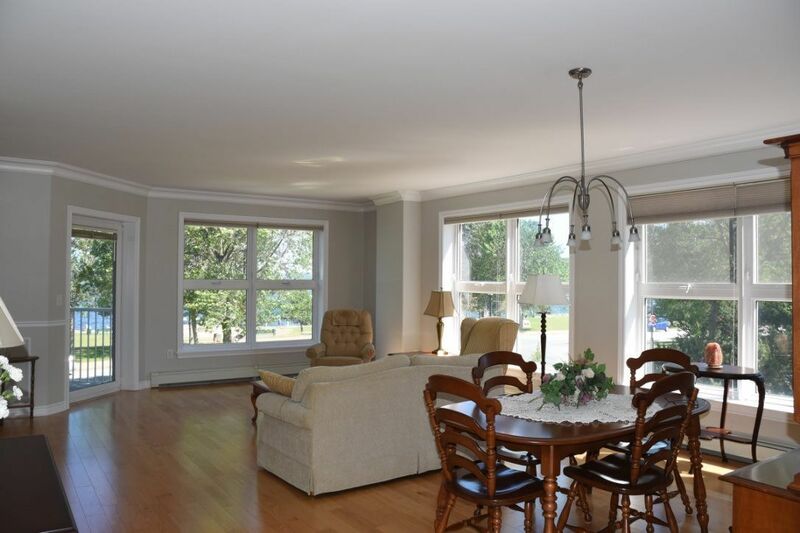 Ft. direct waterfront CORNER CONDO with water views of the Bedford Basin and DeWolf Park. The 2 bedroom, 2 bath, plus den/office with an open concept living room/dining room 2nd floor has beautiful hardwood floors, is air-conditioned and freshly painted. The large kitchen floor plan includes an extra pantry and under-counter lighting. The master suite has a built-in armoire, walk in closet, full ensuite with 2 sinks and whirlpool tub. Extra touches include wainscoting in living room, custom blinds, UV window-shield treatment, storage room, heated underground parking. Additional benefits; extra parking is available and condo fees include heat & hot water, security, live in Superintendents & keyless entry. This resort like community- Convoy Quay Gardens offers a 3 km waterfront boardwalk, clubhouse with library, wood workshop, outdoor heated pool, and magnificent gardens with a water fountain. Push the elevator button and you are on the Bedford Waterfront to watch sailboats racing by or simply take a stroll to restaurants, banks & coffee shops.